Helicopter Tjungarrayi is best known as a painter working for Warlayirti Artists at Wirrimanu (Balgo). In recent years he has produced prints in association with Northern Editions print workshop at the Northern Territory University. In this print the strikingly captivating Balgo colour-fields are translated into the print medium. 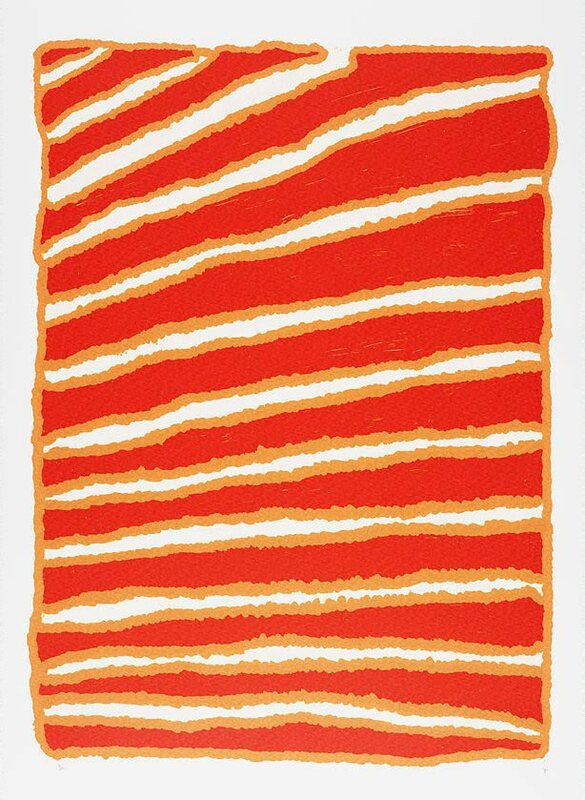 Documentation from Warlayirti Artists states that this screenprint depicts Helicopter Tjungarrayi's traditional country which is located far to the south of Balgo in the Great Sandy desert near Jupiter Well. It was in this country that Helicopter was born and travelled and hunted as a young man with his family. The lines in this print represent the tali, or sand dunes, which dominate the landscape. Signed l.r. corner, pencil "X". Not dated.